First, I am thrilled to inform you all of the upcoming biennial UIBC Youth Cup World Championships to be held in Taiwan in March 2014. It will be not only the first one held since the merger of UIPCG and UIB, but also the largest international bakery competition Taiwan has ever undertaken. Taipei Bakery Association is honored to have won the bid for the sponsorship of the world’s largest international bakery competition, thus giving young students who are passionate about bakery, professional practitioners, and the general public in Taiwan a chance to see the consummate skill of bakers from around the world. This is not just a rare experience to learn from and connect with the world, but is also the pride of Taiwan’s baking industry. As we all know, UIBC plays an important role in nurturing bakery talents. This world stage is specifically intended for young bakers. In addition to enabling young people from the baking industry to demonstrate their outstanding ability and promoting mutual exchanges among baking practitioners from around the world, this contest is also regarded by the international baking community as the Olympiad of bakery competitions. As the host country of the 2014 UIBC Youth Cup World Championships, Taiwan is ready! Over the past ten years, Taipei Bakery Association has endeavored to select outstanding Taiwanese bakery contestants through various competitions and has made every effort to train them in order to help them achieve dazzling results in all kinds of international competitions. Through this contest experience in Taiwan, you will see that Taiwan’s diversified bakery development is worth sharing with its world partners. Taiwan boasts not only outstanding talents, technology, and equipment, but also the extraordinary industrial chain that wins Taiwan the reputed name of a major bakery country. Many people have rendered efforts and hard work to produce this outcome. We look forward to seeing you and your partners and family. Taipei Bakery Association will make every effort to ensure that every UIBC contestant and guest sees Taipei in its most perfect image. 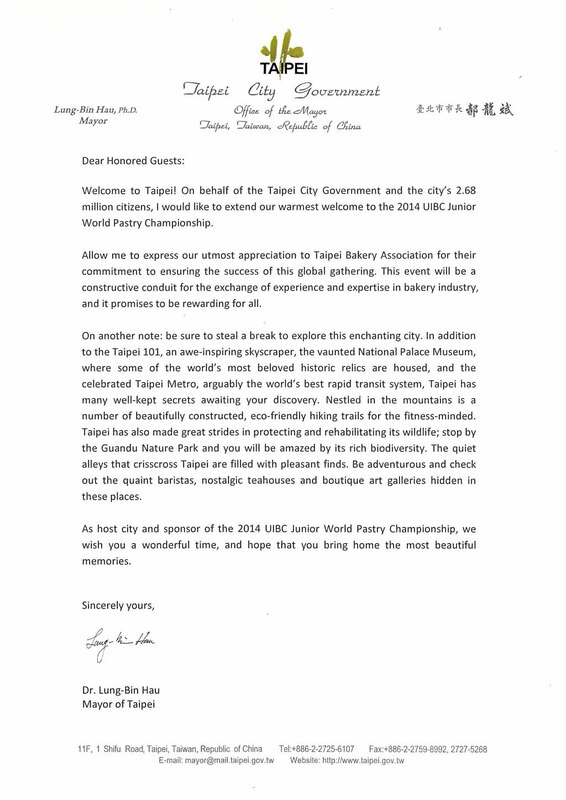 Finally, on behalf of all Taiwanese bakery companies and young students, the Chairman of Taipei Bakery Association would like to cordially invite you to experience the taste of happiness in all corners of Taiwan.